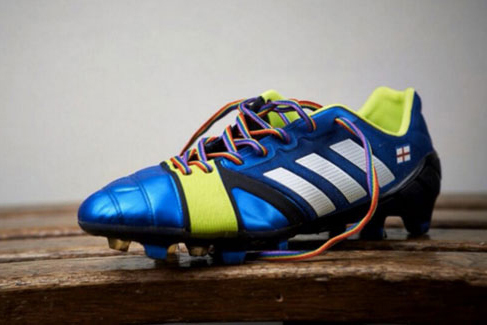 Aon, Adidas and Aviva are supporting the relaunch of this year's "Rainbow laces" campaign by LGBT equality charity Stonewall to combat homophobia in sport. The campaign, which returns in November, aims to show that everyone can take part in and enjoy sport, regardless of their background, and will ask the public to wear rainbow laces and organise events to show their support. Previous campaigns have been backed by Paddy Power last year and Metro in 2014. This year, Aon, Adidas and Aviva are supporting the campaign by joining a newly formed coalition called TeamPride. TeamPride will bring together organisations from different sectors to work together and with Stonewall to create inclusive and equal environments in sports of all levels for lesbian, gay, bisexual and trans people. The return of "Rainbow laces" follows new ICM research for Stonewall which says that 18- to 24-year-olds are twice as likely to agree that it is acceptable to make homophobic remarks (21%), compared to 11% overall. Young people are also twice as likely to say they would be embarrassed if their favourite player came out as gay – 22% compared to 12% of all respondents. Ruth Hunt, the chief executive of Stonewall, said: "We’re pleased that such powerful organisations have stepped up and given their support to our 'Rainbow laces' campaign, and now we urge more organisations to become part of our team. "Sport should be everyone’s game but sadly, the research released today shows that homophobic, biphobic and transphobic abuse continues to heard on the terraces and in sports arenas across Britain. This abuse makes LGBT fans and players feel unsafe, unwelcome and unable to be themselves. This needs to change, and to make that happen, we need the support of high profile sports clubs and personalities this November. We all have a responsibility to show that sport is for everyone."